While most people are being complimentary when they refer to a business as a “best kept secret,” the designation must make the owners sweat a little. They’d probably rather be known as “that place with the long line to get in.” As nice as it is to have a cult following, in restaurants as much else most owners hope for a blockbuster. Some places are destined otherwise. 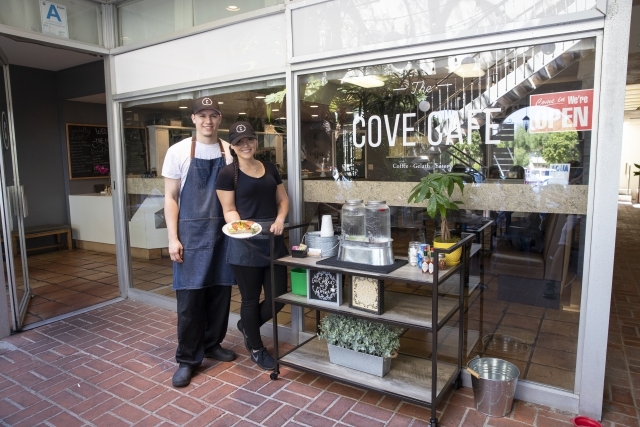 The Cove Cafe in the Malaga Cove Plaza starts out with a low profile due to its location in a courtyard with trees blocking the view from the parking lot. A few tables are visible in the shade, but the patio cafe at the nearby market is more visible. Pass those tables beneath the green canopy and you see the entrance. The interior space is functional rather than welcoming, but on multiple visits the staff has greeted people at the door and generally been hospitable. There are separate menus for breakfast and lunch, and don’t bother taking both because they only serve the former from 8 to 10:30 a.m. and the latter from 11 a.m. to 3 p.m. closing. That’s understandable in a small operation like this where the cook can be slammed with a crowd and wants to keep orders moving. But it has apparently annoyed some people who wonder why McDonald’s can serve breakfast all day and The Cove Cafe can’t. Helpful hint — McDonald’s is an assembly line using mostly frozen ingredients, and this isn’t. There are other places where you can get a breakfast burrito at 10:31, and you can come back here next time. That said, while they do serve a breakfast burrito here, it’s not my favorite item. It’s serviceable, two scrambled eggs with some hash browns, cheddar cheese, and two slices of bacon wrapped in a tortilla with some medium sauce on the side, but nothing about it stands out. The breakfast tacos are better, the same ingredients minus the potato but with sliced radishes, fresh cilantro, and a drizzle of crema that add a little texture and variety. Pair either one with a good latte or cappuccino and you’ll have a breakfast that will get you on your feet. The item that stood out was the pea toast, a large piece of sourdough with a generous spread of fresh burrata topped with fresh English peas, radish, a sprinkling of greens, and a drizzle of olive oil. I started out as a skeptic about all things toast a year or two ago when avocado toast became a culinary synonym for trendiness. Experiences since then have changed my mind. Yes, it’s not anything you can’t do at home, if you have fresh cheese and greens, but most of us don’t. The pea toast, along with salmon and avocado versions, is available at breakfast and lunch and worth ordering. The lunch menu is more creative than the breakfast’s, and the braised short rib flatbread seems to be the standout item. It’s a thin crust with mozzarella, pickled red onion, and cilantro along with shreds of very tender, flavorful beef. The pickled onion and cilantro add sharpness without heat, and it’s altogether successful. I was also enamored of the turkey panini with pesto, pear slices, goat cheese, and arugula, which had a sound mix of flavors and textures. It was served with some spicy pickled peppers, to which I would have preferred some chips or green salad. The plates here are sparse and would be improved by some imaginative accompaniments. A few Mexican pickled carrots with the breakfast burrito, or a bit of salad with the flatbread, would cost the kitchen pennies but would enliven both the look of the plates and the variety of flavors. Sometimes a bite of something else in the middle of a meal reboots our taste buds so we experience the flavors anew. Service at the Cove Cafe is friendly but can be slow when there is a crowd. If you’re in a hurry it’s probably best to order ahead, but if you’re not, enjoy the time in the shady courtyard. It should also be noted that they do not have a public restroom, which can be a problem for those with small children. Because of those limitations, the Cove Cafe may be destined to remain a secret spot, a hangout for a niche of diners who enjoy a little place with personality but some quirks. They have been open for just over seven months and I have never seen them completely full or empty, so they may have found their groove.